Milo here, back again and branchin’ out! ‘Tis an honour to write the first graphic novel review for Jason’s Movie Blog, but let’s not get sentimental about it *sniff sniff*. As per, links will be below if you like what you see. The 80s were a good time to be comics fan… and a movies fan… and a music fan. They just seemed to be pretty good in general, actually, not that I’d know. However, let’s stick to comics right now, this is a graphic novel review after all. I first read The Dark Knight Returns when I was fairly new to graphic novels and I just didn’t get why it was “so good”. The art style was a bit weird and there was a lot going on, I mean there are three antagonists, one of which was flippin’ Superman. While these points are both still true, as I’ve matured and revisited this one multiple times, I can definitely appreciate it more. That being said, I don’t really believe it’s the classic that everyone says it is, that’s not to say it’s bad though, far from it. Like Alan Moore, Frank Miller is one of the legends of the graphic novel industry, known for his work on Daredevil, Spider Man and Gotham’s resident crime puncher, as well as his countless original storylines Sin City, Ronin, 300, among others. He has been praised for his film-noir inspiration on many of his comics, like Batman: Year One and the aforementioned Sin City, as well as his ability to deliver complex and unique stories. Oh, the story, where to begin? Following Jason Todd’s death at the hands of The Joker, Batman hangs up the cape for a decade. However, the role begins to beckon to him and, at 55 years old, Brucey starts stomping some teeth in. His first exploit entails a recently “reformed” Two-Face, who was holding the city ransom with a bomb, getting thrashed up by the Bats. Not everything is the same, however, as the police and the government are now cracking down on the Batman’s resurgence, with Comissioner Gordon retiring and Superman now working for the US. What follows is the introduction of a new Robin, in Carrie Kelley, and the team confronting a gang of Mutants, The Joker and, finally, The Son of Krypton himself. While the story undoubtedly has all the hallmarks of its writer, I don’t see it in the same league as some of the other Batman or Miller stories. I can’t deny, however, that it isn’t a bad story, by any meaning of the word. There are, as I said, many antagonists and side stories that keep the reader interested in what’s going down, as well as plenty of action sequences to entertain, as you’d expect. However, it doesn’t elicit much from me. I’m not emotionally attached, shocked by or really interested in the characters, what they’re doing or how they turn out. I guess I’m just missing the story’s character, really. But that’s just me. Now it’s time for Milo’s Art Corner! Gather round kids! OI! TIMMY! GET OUT OF THE SINK YOU LITTLE SH*T! Let’s talk about colours n’ lines n’ that. 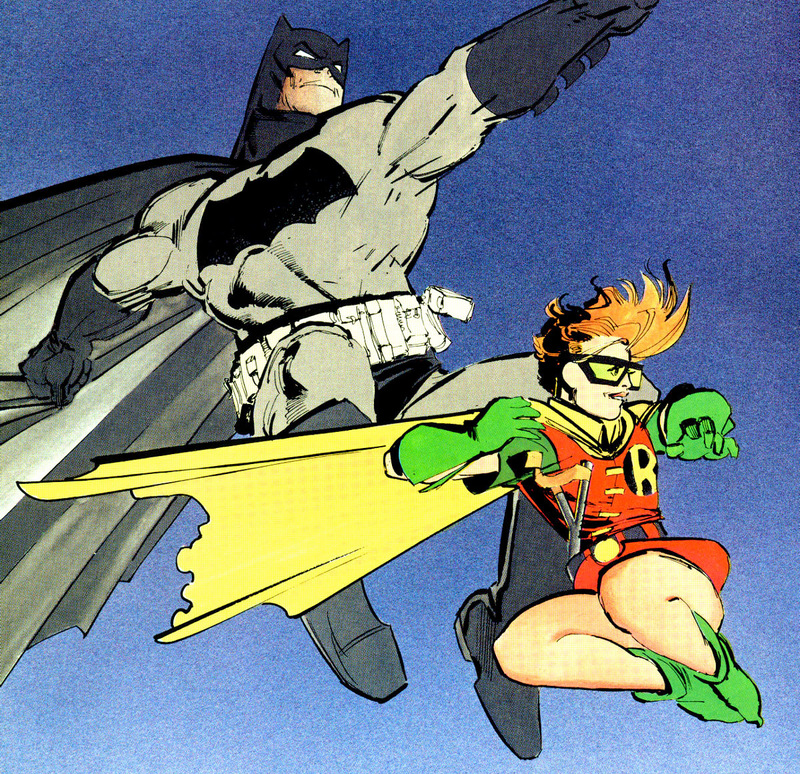 Frank Miller’s unique writing is usually illustrated in similar fashion and The Dark Knight Returns is no exception. Pencilled by Miller himself and inked by Klaus Janson, of World War Hulk fame, the artwork itself was one of the things that confused me as a young reader. At the time, I had grown accustomed to the relatively standard artwork of the aforementioned World War Hulk and The Killing Joke, so I hadn’t really seen anything like the soft line and colour combination used here. Upon revision, however, I can appreciate the artistic merit of it and, while it still may not be my cup o’ tea, it is pretty good. The colouring, by Lynn Varley, is quite soft, almost reminiscent of watercolours at points, which isn’t my bag, as I said. The artwork on the whole almost borders on abstract at points. I wouldn’t particularly go for it myself, but I can’t deny how unlike it is to anything else in the mainstream comic book medium. Overall, The Dark Knight Returns isn’t the masterpiece it’s all made out to be. The skeleton of the story is pretty basic, but, thanks to Miller’s branching narratives and underlying themes, is dressed up as something a lot better, which is great. While the artwork isn’t for me, it is very different and it will stick with you, but the softness of the lines and colours led me to lose interest at parts. However, read any other review and you’ll find that I’m in the minority, so I implore you to read it for yourself, if you haven’t already, and make your own mind up. Like that? I bloody well hope so, for my sake (Jason rules with an iron fist). Well, if you did, be sure to check my home planet Stuff And That. where we review movies, music, games and graphic novels new and old.